Fig. 1 ABC Analysis. The Pareto curve. a means of classifying items such as sales, stock, etc., in which items are ranked according to their relative importance to the firm. For example, products may be ranked according to their sales value, as in Fig. 1, with sales items plotted cumulatively on the horizontal axis and sales cumulated on the vertical axis to show a Pareto curve. 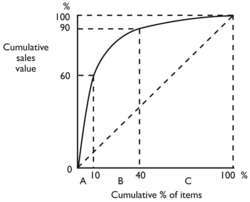 Using this curve it is possible to place items into three classes: A items, often the first 10% of items, which may account for up to 60% of sales value; B items, often the second 30% accounting for perhaps 30% of sales value; and finally C items. Having classified items in this manner it is possible to develop STOCK CONTROL procedures which are appropriate for each class of item. In retailing, for example, products could be ranked according to their profit margins and the speed at which they sell, for example a high margin, fast-moving product could be ranked A and at the other extreme a low margin, slow-moving product could be ranked C. The rankings can assist management to decide the frequency with which the items will be monitored, for example A items daily, B items weekly and C items monthly. See PARETO DISTRIBUTION. id=37502012) ABC analysis found that, contrary to the president-elect's frequent criticism of the practice of outsourcing, most of her clothing and accessory line had been manufactured in China. Activity in the sector dipped 1 percent in June, a third consecutive month of contraction, according to an ABC analysis of U. The ABC analysis is a well-known and practical classification of inventory items based on the Pareto principle. A number of papers presented in the literature were dealing with the problem of items classification in uncertain environments for inventory control purposes and proposed fuzzy multicriteria ABC classification approaches after realizing the importance of considering multiple criteria in the ABC analysis . ABC analysis is a well-established categorization technique based on the Pareto Principle for determining which items should get priority in the management of a company's inventory. ABC analysis is widely used in various business scenes as one of the fundamental methods of inventory control, which not only the staff directly in charge of stock control but any businessperson should understand, master and effectively use in practice. Table 3 is an ABC analysis that calculates how much of each resource is consumed by each of the different lines. The results of the ABC analysis revealed that TEC's largest customer generated losses equal to almost 200% of the company's total profits and that more than 70% of TEC's customers were generating losses. This process normally begins with an ABC analysis, which will determine the items that move the fastest (A's), those that are intermediate movers (B's) and those that are the slowest (C's). Toward this end, the authors strongly recommend such techniques as employing an inventory tree method to classify inventory according to its characteristics and using an ABC analysis. The ABC analysis revealed the fundamental differences that existed between the different mixes of product characteristics.